The design asks blunt questions. Would you rather see trees or more glass and steel? A building that tries to mitigate its impact on the urban climate, or one that contributes to the heat-island effect? A tower that’s a beacon for migrating birds and butterflies, or that further disrupts their flight? That absorbs carbon dioxide, or doesn’t? When architect Brian Brisbin of the Toronto firm Brisbin Brook Beynon first started experimenting with the idea of nature being integral to office and home design, the questions were gentler. They were about removing the wall, mentally as much as physically, between the natural outdoors and inside spaces. The idea now is to apply this approach to a condo tower, covered in trees and linked to a global movement in what have come to be known as vertical forests. 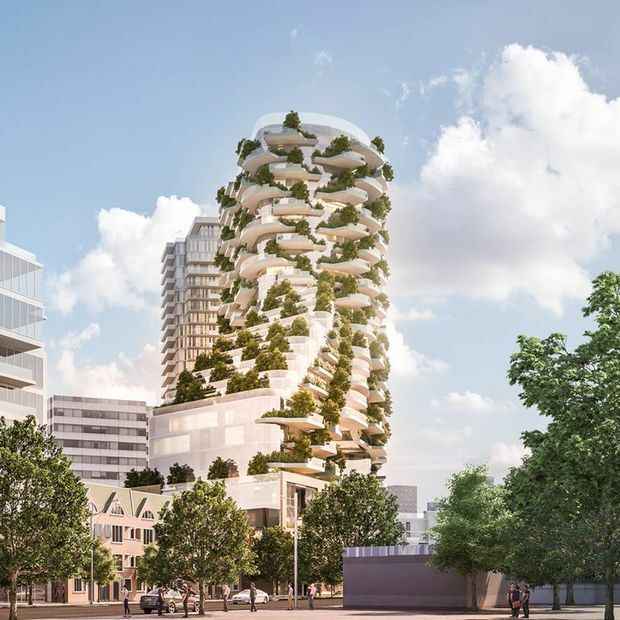 Mr. Brisbin’s tiered, fully tree-clad tower would be a first in Canada and is being planned for a plot adjacent to Designers Walk, an area of architects’ and designers’ offices in a corner of the Annex and Yorkville neighbourhoods in Toronto. The development application is now before the city seeking approval. A rendering for the proposed 27-storey Designers Walk building in Toronto. It’s part of an international movement in creating vertical urban forests. “Twenty-five years ago, awareness of the heat-island effect, storm-water management and green roofs wasn’t that profound, because the consequences hadn’t quite been as clear,” Mr. Brisbin said. Today, the consequences are more dire, less about aesthetics and more about climate change. A typical glass and steel condo tower or office building does “absolutely zero for the heat-island effect of our cities. It’s doing nothing for the green canopy, oxygen, carbon dioxide. So our approach is literally nature and its relationship to an urban environment, and how it’s going to survive the heat-island effect and carbon footprint,” Mr. Brisbin said. Each tree on the building will have its own ID and will be monitored by a computerized control system. Each will be planted with sensors reading irrigation and nutrient levels. Creating more of a tree canopy is often the stated goal of cities, including Toronto under Mayor John Tory. But it’s a problem of space and, of course, budgets. “The mayor’s tree canopy can’t happen. It’s not viable. He’s already stated that. You simply can’t increase the city’s canopy by 30 to 40 per cent [by planting trees] on the sidewalk. So, we have to look at a solution that’s vertical,” Mr. Brisbin said. The proposed Designers Walk building would have more than 450 trees, requiring major structural considerations to accommodate the trees, with irrigation, fertilizing and monitoring systems built into the structure. “A vertical forest is really like a hillside. It’s not potted plants on a decorated building. The building is really a host, like a hillside,” Mr. Brisbin said. It also adds a premium of more than $20-million to the cost of the 27-storey building. The developers are Cityzen Development Group, known for not shying away from attention-getting concepts. The “Marilyn Monroe” condo towers in Mississauga, which are shaped like giant, curvy hips stretching two enormous, metallic pencil skirts, are one of Cityzen’s other projects. It’s true that the Designers Walk project is solely ecologically minded. 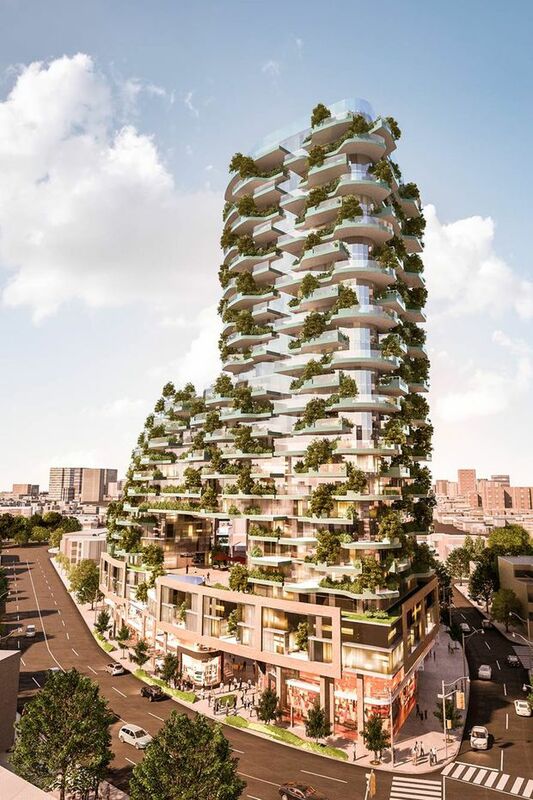 It will likely attract the same kind of attention as similar constructions around the world, notably Bosco Verticale (Italian for vertical forest), which was completed in October of 2014 in Milan and designed by the movement’s leading firm, Boeri Studio. Yet while the Milan towers are the most celebrated prototype, tree-clad towers are still very much in the invention phase. Each building, each design, each building’s maintenance system is so site-specific – and dependent on the local climate, available light and wind – that there is a nascent but growing market for firms that can carve out a specialty in this. “My thought is that wherever we have this opportunity, we should take advantage of it and do this,” developer Sam Crignano of Cityzen said. When Mr. Brisbin visited Bosco Verticale, he wasn’t able to get a formal tour of its maintenance system and inner workings, so he went on Airbnb and moved into the building for a while. “I started pulling apart all of the panels in the floor, everywhere, to find out where all the systems were and how they did it,” he said. Back home, a team was gathering around the Toronto project, including Paul Offierski, of the major nursery PAO Horticulture, and Marc Vanden Bussche, of Vanden Bussche Irrigation, as well as advisors such as Robert Wright, the University of Toronto’s dean of forestry. Mr. Brisbin showed what he found in Milan to the team, “and I showed this to Vanden Bussche himself, and he just started laughing. He said, ‘None of that stuff’s from [Italy.] It’s entirely from Canada and the U.S.’” In other words, the inner workings were readily available. Each tree on the proposed Toronto building will have its own ID and will be monitored by a computerized control system off site. The needs of each tree will likely be very different depending on which floor they will be situated. So, each will be planted with sensors reading irrigation and nutrient levels. And here’s where Mr. Brisbin’s pitch goes beyond aesthetics and urgent environmental concerns. He sees the potential for a new mini-industry: a tree-clad technology that could be applied to other new buildings, a kind of plug-and-play system, as he describes it, in which the trees are plugged into a maintenance system.